Irkutsk is one of few cities in Russia, which has a solid number of monuments - more than 1200, according to a noteworthy contribution to the history of the country and more than three hundred years age. The majority of them are monuments of architecture. There are many historical monuments here. Irkutsk also has archeological and monumental art monuments. The majority of them have a local importance, but there are objects of Russian scale. In our city there are more than 10 monuments of city-building art - reserved streets and zones. 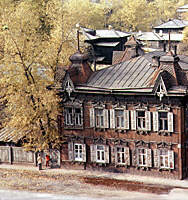 Irkutsk has the largest treasury of wooden architecture monuments among Siberian cities. The whole districts of the wooden houses are kept. The woodcarving, lacy designs skillfully decorate ridge-roofed houses, window frames and door jambs. "I visited many cities and capitals of different countries and I can tell, that such wooden architecture and amazing carving, as seen in Irkutsk, is not present in any corner of the world", - an artist Ilya Glazunov responded about our city, well- known connoisseur and defender of the Russian old. First of all, he meant baroque carving , which distinguishes Irkutsk from all cities, without any exception. And a well-known Irkutsk writer Valentin Grigoryevich Rasputin expressed those feelings, that a man can feel warmly, figuratively and sincerely, contemplating results of works Siberian skilled craftsmen: "It is not easy to build a house it would be warm convenient to live in. It’s been built for a surprise and lovely sight, like a painting and a magic house where a magic life would begin. It was considered to be important and, as we now speak, prestigious. A spirit of rivalry in innovations and beauty has never left a Siberian and made him do many remarkable acts. Only a man from Siberian ancestral home (Arkhangelsk area, Vologda territory, Great Ustyug and Novgorod territory), the areas first Siberian masters took their craft from, could be equal to the Siberian art. The Siberians brought and developed it up to a surprising perfection and indefinitely fanciful imaginations, evoked by new life and new open spaces. The Siberian masters used their art everywhere - in a city and village, among the rich and poor, at the hunters, ploughmen and master people. Only a complete beggar with an empty pocket spirit, having built its house, did neither decorate and paint it nor make a design. Such absence of art remained a seal of his poverty and hopelessness for all his life. 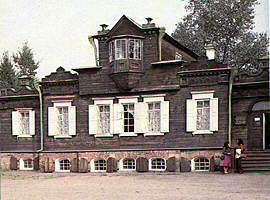 Such a cabin (house), as now is well notable, got older soon, having buried its window into the ground; one could look at it, “poor fellow” with bitterness among near-by standing strong, vigorous, decorated with carving houses. Constructed for being a pleasure to people, until now, they also bring it despite its a complete century age. Even the most insignificant of them, with the most simple furnish, nevertheless keeps its appeal, dignity and forever a noble soul of a master". Public buildings have many wonderful examples. There are more than a hundred total: a row of unique churches, objects of architecture, engineering and garden-park art. The buildings of drama and musical theatres, regional and art museums, Philharmonic society (it used to be a Public assembly there), bridges, parks, Bazanov’s orphanage house (nowadays there is an eye clinic there), the management of the Eastern-Siberian railroad, movie theater “Art". The White house, Empire style palace with perfect lines, still decorates the city. It was built not later than 1804 by a rich merchant Sibiryakov on the Angara river bank. This remarkable palace, constructed presumably according to the project of the architect Kwarengi, is built in Russian classicism style. It pleases an eye with a strict proportionality, majestic six-columned portico, grace and harmony of architectural details and ornaments. 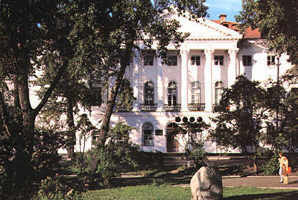 It used to be a residence of Irkutsk general - governors, and in 1918 Irkutsk university was placed there on the day of its opening. Now there is one of the largest University libraries of Russia – the Zonal scientific library of Irkutsk state university here. 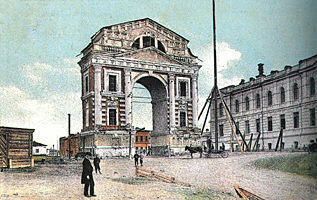 In 1811-1813 the Moscow Triumphal gate was built on the Angara river bank. This stone gate played a role of parade entrance into the city. It had a large size (19 meters high and more than 16 meters long). The gate was visible from a far distance from the Moscow road. It was constructed in the honor of one decade anniversary from the date of Alexander I rule (the gate was not kept until now). In 1908 the monument to Alexander III was solemnly opened in the honor of the end of the Siberian railway construction. The pedestal of the monument is decorated with high relief and images of a conqueror of Siberia Ermak, General - Governors M.M.Speranskii and N.N.Muravyov-Amurskii; its eastern side is decorated with a bronze double-headed eagle, holding an imperial order about the Siberian railway construction. In 1920 the monument was dismantled. It is possible to refer a number of Irkutsk monuments to unique historical relics: a tomb of seafarer G.I.Shelikhov, the House and burial place of the Decembrists, a tomb of the historian A.P.Schapov and playwright A.V.Vampilov. The ice breaker "Angara" - most ancient of the icebreaking type ships in our country has a dramatic destiny. 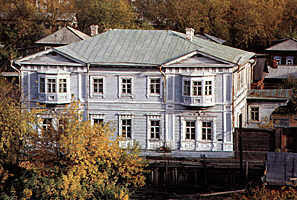 In 1977 the decision of Irkutsk city executive committee to open a museum on the vessel was taken. However, there was not done much. The ice breaker appeared to be ownerless; it burned and eventually sank. When in 1985 the ship was lifted up to surface, and regional Counsil insisted on its transformation into a museum, its restoration works began in 1988. In a cultural - ecological centre 1991 was opened on the ice breaker. Among archeological monuments there are two especially interesting kinds of them: settlements and funeral objects. Among 17 archeological monuments 16 ones represent settlements. One of them is especially important – the first settlement site of the Paleolithic epoch, opened in Russia (1871). An archeological monument is located on one of the right bank heights of the Ushakovka river, in the mouth part, on the territory of military hospital (Kuibyshevskii district). The significance of the monument is not only in a fact that its opening contributed to the beginning of Russian Paleolithic Studies. It was the first time when Paleolithic art articles were found. An extremely interesting sepulchral site, globally known, was found. It is the Glazkovo necropolis, its significant part is on the territory of the Paris Commune park. Burial places of many ancient people and nephrite and bone products of rare historical and art value were found here. The protection of monuments of the past began a long time ago: at first, it was Irkutsk scientific archival commission (1911). In 1912 church-historical archeological society was opened, called to watch conditions of ancient temples and other cult relics. Now the Centre of preservation of heritage and All-Russian society of historical and cultural monuments protection - its Irkutsk branch, are engaged in study and protection of monuments in Irkutsk.